We are a company “born” from a mother’s love for her child, and a determination to give her child the very best start at life. This love drives us each day to provide you with the highest quality, science-based fitness solutions that we believe every mother deserves. Brittany Citron had a pretty straightforward career – graduating from Business School at the University of Michigan, then working as a corporate marketing executive for over a decade… until two little pink lines changed everything. She had waited two and a half years for those lines, so finally seeing them had quite the impact. Suddenly, being strong and healthy was more than just a personal passion; it was her first – and most important – maternal responsibility. Feeling frustrated by the abundance of conflicting information on prenatal exercise, she began doing her own research by studying the specific stresses and demands her body would be going through, and creating a training program to prepare her body for those demands. And it worked. Brittany was fortunate to experience a pain-free pregnancy, smooth delivery, and fast recovery – and she believed her training played a large role in this. The real turning point for her, however, was watching some of her friends make different decisions due to a lack of appropriate information — deciding to “play it safe” and avoid exercise altogether, or pushing themselves too hard doing the wrong things — only to suffer injuries and experience (potentially avoidable) labor complications. Her friends, like so many women, did not suffer from a lack of motivation; instead, they lacked appropriate information and resources – and they deserved better. 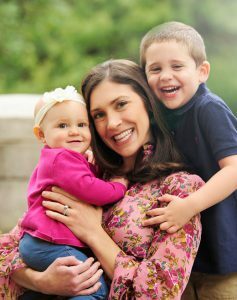 Driven by a newfound motivation to help mothers everywhere train for what is truly the event of a lifetime, she said goodbye to her steady paycheck and corporate “security blanket,” and set forth on an exciting new path that eventually led to the birth of her second great labor of love – PROnatal Fitness — in 2015. News quickly spread about the company’s unique approach to training for motherhood like training for a major athletic event, and the rest is history. Brittany never could have imagined the journey that would follow from those two pink lines, but as one of her former companies (Johnson & Johnson) said so perfectly “having a baby changes everything”….to which Brittany would add, “in many more wonderful ways than you could ever predict.” Here’s to motherhood and the incredible adventures it brings!